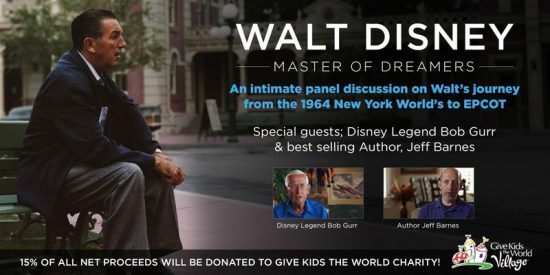 The new documentary “Walt Disney – Master of Dreamers” is set to premiere later this year, and it features Disney Legends Rolly Crump, Bob Gurr, and Richard Sherman (along with authors Jeff Barnes and Sam Gennawey and animatronics pioneer Garner Holt) discussing Disney’s path from the 1964 New York World’s Fair to EPCOT in Florida. In commemoration of this historically significant new movie, the filmmakers will be hosting a panel discussion between Bob Gurr and Jeff Barnes (“The Wisdom of Walt”) in Celebration, Florida– the planned community originally developed by Disney just outside of Walt Disney World. Walt Disney – Master of Dreamers from Anthony Cortese on Vimeo. The event will take place on Saturday, April 28 and will cover Gurr’s time working alongside Walt Disney in designing the Disney theme parks, in addition to the journey from the World’s Fair to EPCOT. Tickets to the discussion are $50 each, with 15% of profits going toward the Give Kids the World charity. Visit the “Walt Disney – Master of Dreamers” official website for more information and to purchase tickets.